Based on my previous gold analaysis I waited for possible entry and after this decline I placed my long at 1188.75. Position is protected with SL at 1185 for now. As I wrote before, H4/MA200 stoped the precious metal on the way up, where sellers have taken over the gold, and push the price down to 1188. You can see why I have decided to enter at that level. Gold broke that trednline on the way up today and on the way down, the outer trendline has become support. Even gold doesn’t look bullish now after this move down, I see a possible turnover up again. If gold bulls manage to turnover the situation in their favor, MA’s are waiting again for the buyers and 1200 resistance as well, as I wrote in my previous daily chart. This is 1:6,5 RR trade, let’s see how will this ended!? 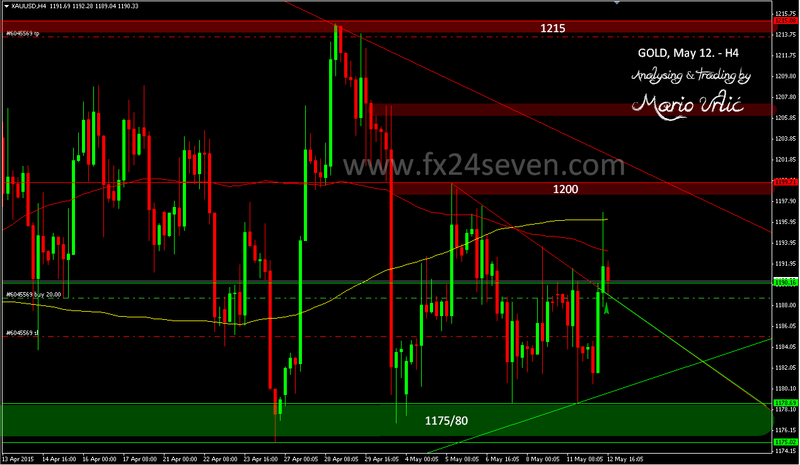 If gold catch 1200, I will move my SL above my entry. Can you make an analysis in gbpnzd please? Thank you for the gold analysis so far! Sorry, I don’t analyse those pairs. I focused myself only at several majors and gold.